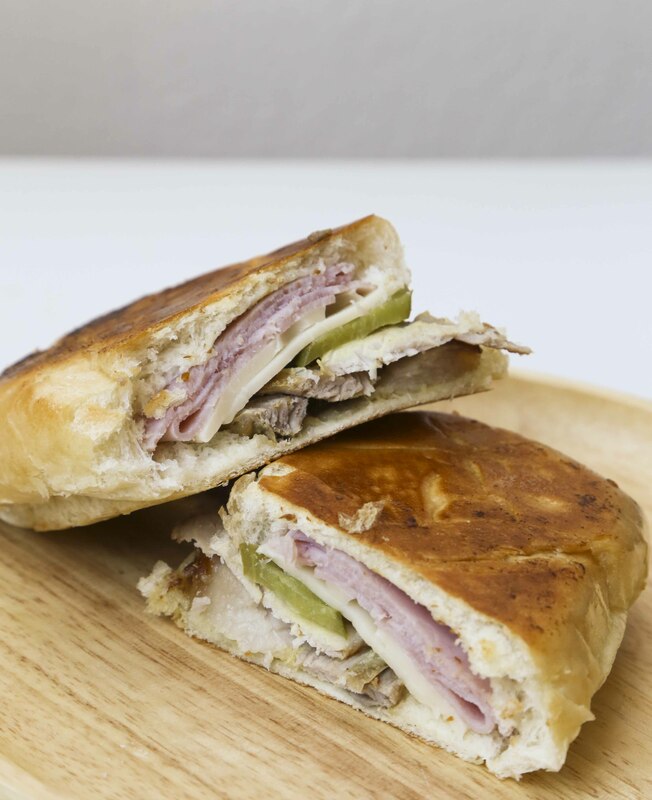 If you watched the movie The Chef, you probably wanted to eat a Cuban sandwich the entire second half of the movie. Maybe that’s just my inner fat kid talking but ever since watching that movie I’ve had a hankering for Cuban food. My favorite spot, Versailles (both in Miami and in LA, different owners I believe), are a little out of reach. I decided to take matters into my own hands and roast a pork leg and make some damn sandwiches! Isn’t that how all good stories start? Let’s be honest. Sometimes we just need a good sandwich. 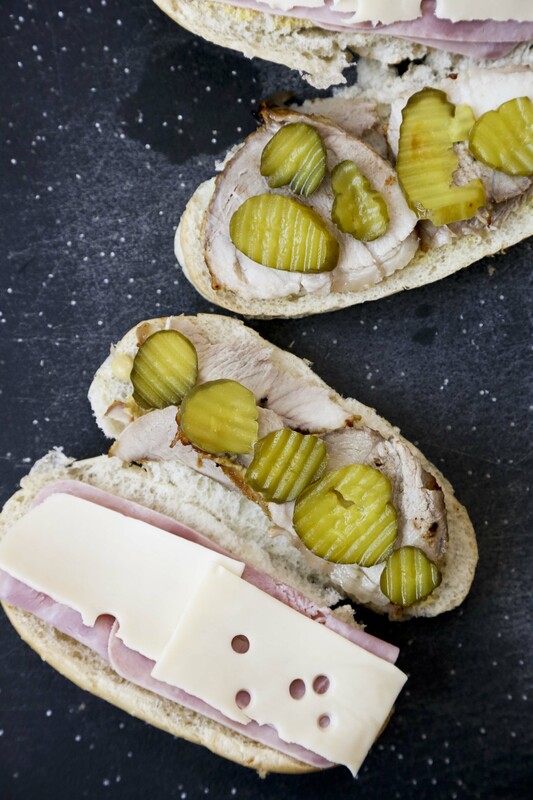 The ingredients are simple: roasted pork, ham, swiss cheese, mustard, pickles. But simple is definitely not what I would call this sandwich. All this started with roasted pork marinated overnight in orange, lemon and lime juice with lots of garlic, onion and oregano. Then I roasted it on high heat to get it crispy then let it cook low and slow for about 4 hours. I’m not sure how to make a hunk of meat look good, but here it is. A hunk of meat that got lots of TLC. Then I sliced it up thin as the base for my cuban sandwiches. You should know they’re delicious because I’m eating one as I type this. My keyboard is greasy and I’m ok with that. So let’s get started. You start with the pork…. In a blender, blend together juices, garlic, onion, salt, pepper and oregano. 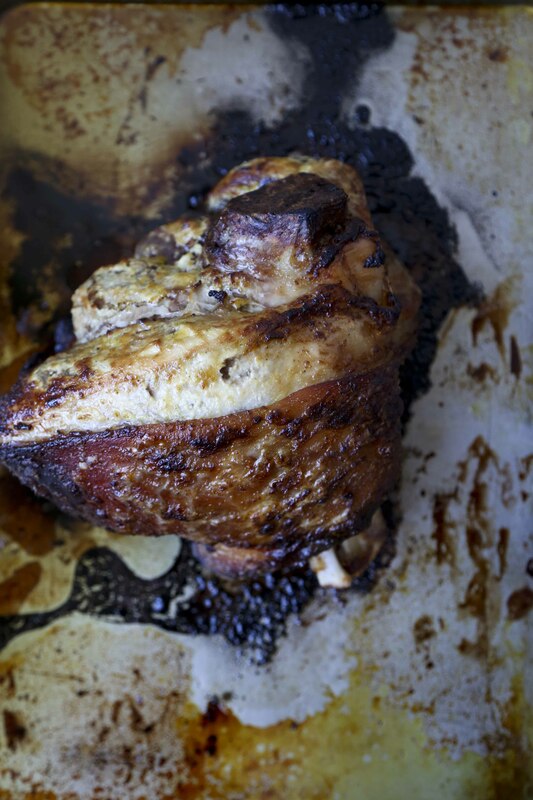 Pierce pork as much as you can with a paring knife. Pour juice mixture over pork leg and marinate overnight. When ready to roast, preheat oven to 450F. Transfer leg to a roasting dish and roast at 450F for 20 minutes, reserve the excess marinate. After 20 minutes, turn down the heat to 300F and continue to cook 4-6 more hours. If you want it falling off the bones tender, cook it longer. If you want it sliceable, it should be ready around 4 hours. If you slice it and it’s still bloody, throw it back in the oven. While your leg is baking, transfer the excess marinade into a sauce pan and boil for about 5-10 minutes. This will be the perfect side mojo sauce for dipping your pork in, also great with rice and yucca. Once you remove the pork from the oven. Let it chill on the counter for about 10 minutes on its own. Then slice for sandwiches. Now you’re ready to assemble your sandwiches. *A note about “dang good bread.” Cuban bread is delicious. It’s soft and wonderful but not always easily accessible. I used hoagie rolls I found at the grocery store. It did the job. Do with that what you will. Spread your dang good bread with mustard (I like a good amount of mustard on there), then top with pickles, ham, roasted pork slices and swiss cheese. Put the sandwich together and grill it. If you have a panini press, use that. If you’re not fancy (like me), put it in a pan with a bit of butter then place another pan on top with a jar of something heavy to weigh it down. And ta-da! Instant panini press on the cheap. Allow to cook a few minutes (low and slow is the best way to go so the cheese melts), then flip and cook for a few more minutes until toasted and melty and delicious. Slice in half and serve. Repeat with however many sandwiches you’d like to make. A whole pork leg will yield a lot of meat, and I understand that this is definitely a process, but trust me, it’s worth it. So invite your friends over, roast a pork leg and make some sandwiches, then go for a walk because you’ll probably need to walk this off. What’s your favorite type of sandwich? This is a tough one for me. This Cuban sandwich was amazing but I also love Vietnamese Banh Mi sandwiches. Maybe that should be my next sandwich attempt! But first… I’m running my first half marathon next Sunday, wish me luck! You have NO idea. I was searching for the best cubans the minute I walked out of the theatre. I’m glad to hear that you like Versailles, that is about the best option I could find but we still haven’t been. And I love that you roasted a 7-pound pork leg. Versailles is amazing! That should be our next food date! I know Allie loves it too! Also 7lb pork leg… Would you expect any less? I LOVED Chef! Such a great movie.. and let’s be honest, Sofia & Scarlett nearly stole the movie. 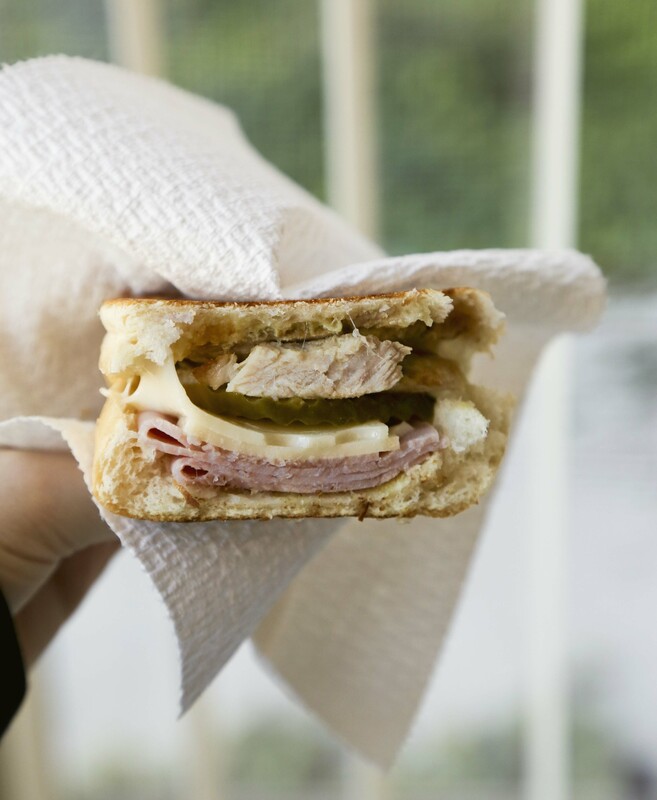 My first Cuban sandwich was in Miami and I fell in love! I’m not a fan of pickles, but I didn’t mind them in this sandwich. Thanks for sharing a delicious-sounding recipe. Can’t wait to try! Truth! I heart Sofia Vergara! Yes girl yes! I had the grilled cheese from the movie at Roy Choi’s restaurant – I really wish he had this on the menu too! Ahh that sounds amazing! That movie had many epic sandwiches! Lynn I’m going to Commissary this weekend and I think I’m going to have to order the grilled cheese! Chef was the best! And a Cuban sandwich is the perfect post-race meal I think too. I’m still totally craving one. You, me and Emily will have to go to Versailles to satiate the craving!